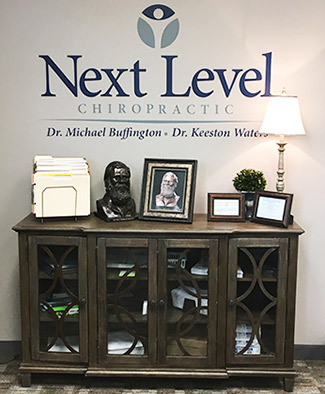 Next Level Chiropractic opened in 1994 as Buffington Chiropractic, founded by Dr. Michael Buffington. When Dr. Waters joined the practice we decided to change the name, taking into consideration that we want to make a difference in people’s lives by taking them to the next level. We combined Buffington Chiropractic and Rockwall Pro Health and became Next Level Chiropractic. Both personally and professionally, our team seeks to constantly improve what we do for each other and our patients. Our practice is committed to helping you discover your full potential so you can live a vibrant and beautiful life. Dr. Buffington was joined in practice by Dr. Keeston Waters in 2015. Together, our dedicated team seeks to use integrated procedures to make a substantial impact on your health and life. The families that we see as patients tend to be healthier than those who are not under care. We seek to be a beacon of light in our community, serving people with the care and knowledge they need to feel empowered and live more fulfilling lives. Over our years in practice, we’ve had the incredible privilege to see life-changing results happen every day. One of our favorite stories to share is about a young boy who was held back by several health challenges. He was unable to participate in physical education and couldn’t live like an active, healthy kid. His parents brought him in and gave Dr. Buffington the chance to perform a thorough evaluation. Within just a couple of months, he was back to running around in PE classes and extracurricular activities. We’ve been fortunate to see him grow up over the years and unlock his full potential. Chiropractic care truly transformed his life! Next Level Chiropractic accepts insurance coverage and offers same-day appointments. Contact us today to book your time with our knowledgeable team!